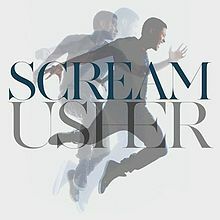 “Scream” is a song by American recording artist Usher from his seventh studio album Looking 4 Myself (2012). The song premiered on April 26, 2012, and was released as a digital download on April 27, 2012 as the album’s second single. It was written by Max Martin, Shellback, Savan Kotecha, and Usher, and it was produced by Max Martin and Shellback, the same team responsible for Usher’s 2010 hit single “DJ Got Us Fallin’ in Love”. “Scream” is an synthpop song with elements of dance-pop that contains sexual lyrics. It is a synth-heavy song and critics noted that it was a club song, similar to Usher’s previous songs. It received mostly favorable reviews by most music critics who praised its composition and its club nature. It debuted at number 70 on the Billboard Hot 100 and number 32 on the Billboard Pop Songs chart due to strong radio play. “Scream” later peaked at number 9 on the Billboard Hot 100, and was also a success in Canada, Japan, United Kingdom, Scotland, and Australia. Usher promoted “Scream” by performing it live several times, but most notably at the 2012 Billboard Music Awards.